Chinook Cabin is nestled in the beautiful North GA Mountains only 4 miles from charming downtown Blue Ridge. 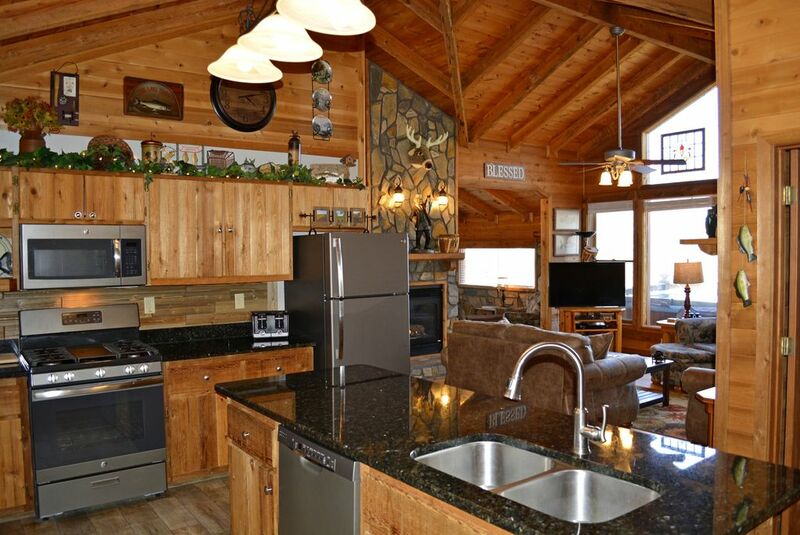 Our wonderful cabin is well appointed, open concept one level living floor plan, and offers coziness at it's best! It has the perfect setting with wonderful views to help you enjoy time with family, friends or that someone special. We are delighted when people tell us they consider our home THEIR home away from home and we want you to feel exactly that! The Chinook Cabin interior is furnished with fun "cabiney" decorative bears, deer, fish, and humorous plaques that will keep you smiling. All of our living space is on one level so no worrying with stairs once you are inside the cabin! Our fully equipped kitchen has been renovated and upgraded with granite counter tops and stainless slate appliances and it's best feature is the mountain view! Enjoy a home cooked meal at the dining table or at the bar top where 4 bar stools accommodate extra guests, and flows right into the great room with an open concept floor plan. The great room features soaring cathedral ceilings with floor to ceiling mountain views and a gas burning fireplace that comes to life with the flick of a switch. The master suite features vaulted ceilings, a private bathroom, king sized bed and HD LED flat panel TV. The 2nd bedroom also boasts vaulted ceilings, a king sized bed, a HD LED flat panel TV, and a bathroom is just a few steps away. The outside deck looks out over a wonderful mountain view and features a porch swing, rocking chairs, and a hot tub looking at that incredible view, framed by beautiful hardwood trees on either side of the view. At night, enjoy our hot tub while watching our laser light display accenting our beautiful trees. On clear days, you can enjoy beautiful moon and sunrises that are sure to please and may just knock your socks off. For our guests, we provide our nearly world famous "Things to Do" and "Area Restaurants" documents which provide you with practically everything there is to do in Blue Ridge from hikes to waterfalls to shopping to Vineyards to Sasquatch expeditions...and everything in between! Want activities? We got 'em! At Chinook Cabin, enjoy taking in nature's glorious sights and sounds while rocking in a chair on the deck, take a soak in the hot tub while enjoying the view, swing on the porch with your special someone, play card or board games, put together a puzzle, read a book in our cozy sitting room, watch one of our provided DVD/Blu-Ray movies on the 50 inch LED flat screen TV, take a hike down our quaint country roads, check out one of the incredible night skies with millions of stars, or just sit and meditate and enjoy the quietness of the surrounding nature. Chinook Cabin is located just about 4 miles south of downtown Blue Ridge, convenient to Hwy 76. Blue Ridge is becoming known for it's charming town full of great restaurants, sought after shopping, vineyards, breweries, and enough activities to keep you entertained your entire stay. About 13 miles south is Ellijay where you can experience numerous festivals, more great restaurants and antique shopping. About 30 miles north is Murphy NC, home of the new Harrah's Casino. We're just a few miles from the Benton MacKaye Trail and various waterfalls, lakes, and rivers if hiking tickles your fancy! Or, maybe you would just like to stay in the cabin, look at the mountains, and enjoy being away from it all. You can have the best of both worlds at Chinook Cabin! As you can see, this location pretty much has it all! Note: We do accept well-behaved pets, dogs only. $75 per dog, 2 dogs max 30 lbs max per dog. No puppies! Dogs are not allowed on our furniture or beds out of respect for other guests. Dogs must be crated when you leave the cabin. Fireplace is turned on from October until March or when the high temperatures are in the low 60's, up to owner's discretion. My wife and I live in the Atlanta area (about 1.5 hours south of Chinook Cabin). I am in real estate, enjoy sports and real estate investing. She is an avid book reader and enjoys reading and working in the yard. We enjoy volunteering at our local church, trying new restaurants (there are some really good ones in Blue Ridge), and working on home improvement projects. We love getting away to the mountains and eventually fell in love with the quaint town of Blue Ridge and the incredible variety of restaurants, boutique shopping, a plethora of things to do in the area, the laid back lifestyle, and the friendly local people. So I decided to purchase a vacation cabin that we could make our own and share that little piece of heaven with others at a good value. The coziness of Chinook is unparalleled, the eclectic doo dads, the back deck with the porch swing and rocking chairs all add to the charm. Then there's the serenity of sitting on the back deck and taking in the view. And if you are lucky enough to catch it on the right day, the sunrise can be "knock your socks off beautiful" as well as the moon rise. One of our favorite things is just to sit in the rockers on the back deck in that fresh mountain air on a clear night and see more stars than you can ever imagine, joined by the twinkling laser lights on the adjacent trees. Beautiful! Layered beautiful mountain view framed by hardwood trees...from the family room, bedroom, sitting room, kitchen and from the back deck. Good cell phone coverage at the cabin with Verizon/ATT/Cricket/Straight Talk/Etc. Central Air Conditioning with Wi-Fi touch screen thermostat. Check the local weather right from the thermostat! We also have ceiling fans in the family room, dining area, and both bedrooms. Gas propane central heat with Wi-Fi touch screen thermostat. Check the local weather right from the thermostat! All bed sheets, comforters, pillows and pillow cases provided along with some additional comfortable throws for couches. There is a full size washer/dryer for our cleaning service, however guests may use them if needed. Hot Tub towels, bath towels, hand towels, wash cloths, kitchen towels and dish washing sponge. We have a dual coffee maker. It will do Keurig k-cups or you can brew a standard pot of coffee. We provide basic coffee grounds, filters, sugar, creamer. Dining area table seats 4 with 4 additional bar stools at the bar top island. Dish Network "America's Top 120" package including music. 190 channels total including popular TV channels along with 60 non-stop Sirius music channels of all different genres. Portable large Bluetooth speaker that can be taken out on back deck. Also 60 music channels on our TV package...all different genres. Approx 15-20 best selling/popular books for you to read along with a study Bible for those interested. We provide a few board games, cards, etc. Our Dish Network package includes 60+ non-stop music channels of all different genres...or just use your phone to connect to our large Bluetooth speaker to play your personal playlist. 2 courses within approx. 10 miles of Chinook. Old Toccoa Farm Golf about 10 miles north and Whitepath Golf about 10 miles south. Hot Tub on back deck looks directly at wonderful mountain view. We empty and re-fill our hot tub after each guest! NOTE: Guests are required to e-Sign our Rental Agreement before arrival to our cabin. Our pet fee is $75 per dog. 30 lbs MAX per dog. No puppies...minimum 1 year old and house broken! 2 dogs max. We don't allow dogs on furniture or beds out of respect to other guests. Dogs must be crated when you leave the cabin. This cabin was the perfect getaway! We had the best time and can’t wait to return! Chinook Cabin was super comfortable and cozy. The beds were amazing and the house had everything we could need. The cabin’s location was also fantastic....super convenient to so many things to do! We enjoyed shopping in downtown Blue Ridge, wine tasting at Chateau Meichtry (thanks Chris for the suggestion! ), Mercier Orchards (wine slushees are amazing), etc. The owner, Chris, was super responsive and answered any questions. He also gave us great suggestions for places to visit while we were there. We are already talking about our next visit in the future! We loved the cabin the first moment we opened the door. The dining table was set gorgeous There’s was wine and personalized welcome card from our host. The scenery was beautiful 🌄�🌅�🌄�🌅� with the hot tub facing the mountains. We made dinner together all modern appliances were available they even had the wine opener! TVs in all rooms, the beds were large and comfy. Enough towels and blankets for a family of six. The grocery store is conveniently located. Our host were the best! Chris and Carried were the best as they guided us from the moment we reserved their cabin. Prior to my family arriving Chris was already sending things to do, a list of restaurants. First off the cabin has a nice view. I could sit on that porch for hours. The cabin is close to Blue Ridge, but when you are in the cabin you feel completely removed. Clean, well maintained, and comfy. The owners are attentive and easy to communicate with. Would definitely stay again. After reading all of the reviews for Chinook cabin, my husband and I decided to make reservations. We were not disappointed at all. Once we walked thru the front door, we felt right at home. The cabin was spotless. We loved the beautiful view from the deck. The hot tub was used nightly....so relaxing. We met some friends at Chester’s in downtown Blue Ridge. The food was delicious. Make a trip to Blairsville and walk the trails at Meeks Park and then head to Nani’s Restaurant. Best rice and beans. You will not be disappointed staying at Chinook cabin. Thank you, Chris and Carrie! This is our 3rd time at the cabin. Chris communicates well and the cabin is in good shape. We always have a great time here. Blue Ridge is no longer just a relaxation destination. It is still great for relaxing, but there are a multitude of other fun activities if you are looking for something to do other than curling up on the couch with a book or sitting on a porch swing enjoying the view, which is great also! In Blue Ridge, you can enjoy a plethora of activities...we give all our guests a "Nearly World Famous" list of Things to Do and Area Restaurants outlining everything Blue Ridge has to offer! Just ask us! - Rates are subject to change until reservation is confirmed with Owner. - Reservations must be made at least six weeks in advance for 2 payment agreements. Reservations made within six weeks of rental require full payment.